Traveloscopy Travelblog: A LEANING TO PORT – THAT’S THE SPIRIT! A LEANING TO PORT – THAT’S THE SPIRIT! FOR wine buffs the historic cellars of Seppeltsfield, in the heart of South Australia's Barossa Valley, are a very, very special place indeed. Because here visitors – wine buff or not – are surrounded by casks of port from every vintage since 1878. That was when Benno Seppelt, eldest son of Silesian-born Seppeltsfield founder Joseph, laid down a barrel of his best to commemorate the opening of the family's new cellar. There are European wineries with older wines than these, but nowhere is there a collection that can match the Seppeltsfield continuum. And those who take a Seppeltsfield Centenary Tour ($85) are encouraged to find their birth-year cask, and are then offered a taste of "their" deep golden tawny liquid that sticks to the side of the glass. Each year, Seppeltsfield bottles and releases a small quantity of 100-year-old port, and a taste of that is also included in the tour. It's quite amazing to see the reaction of visitors sipping a wine made three years before the Gallipoli campaign, and the same year Fanny Durack won Australia's first female Olympic gold medal in the 100-metre swim at the 1912 Stockholm Games. You can buy this century-old wine at the cellar door. And while its $975 for 375ml it's actually quite a bargain, especially when you consider that the loss through evaporation from a barrel over a hundred years – and quaintly called the Angels' Share – is something like 80 per cent. Lucky angels! In terms of both size and age of operation, the opposite extreme of the spectrum to Seppeltsfield can be found at Bob McLean's McLean's Farmgate, a small vineyard perched atop the windswept Menglers Hill, right on the dividing line between the Barossa and Eden Valleys. But the recognition of history and tradition is still pervasive. The vines here look different to most others in the area, and for good reason. 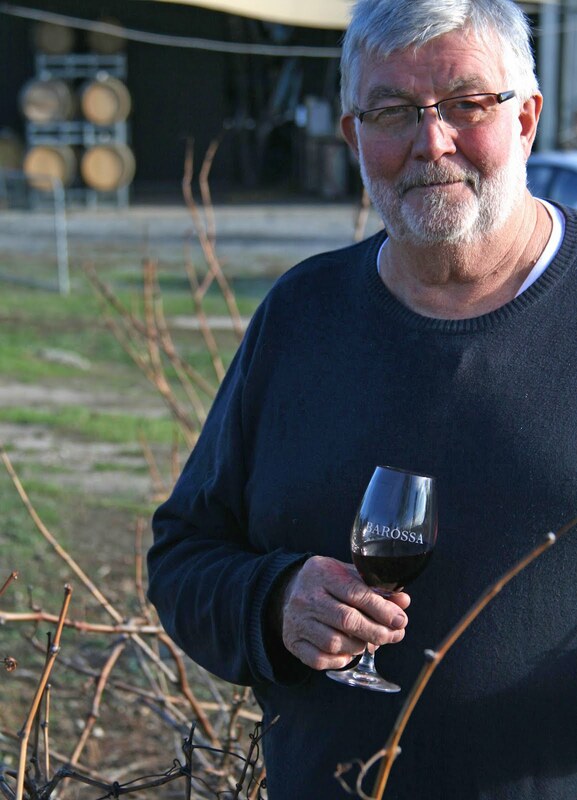 Bob reckons he's the first in the Barossa for about 45 years to plant and train his vines as self-supporting bushes rather than on trellises, just as the valley's European founders did in the 1850s. "It's not as efficient in yields or in use of manpower," he admits. "But I'm sure it produces better fruit and that's ultimately what I'm looking for." He and his wife Wilma also graze some rare sheep — a cross between demara, an African desert breed, and dorper, in turn a cross between dorset and persian breeds. The result is renowned for the leanness of its meat and is part of the McLeans' commitment to an extremely proud local food culture, one that has been made internationally famous by the likes of Maggie Beer. Probably the best place to appreciate the strength of that culture is the Barossa Farmers Market, held each Saturday morning in Vintners Sheds on the outskirts of Angaston. It's a lively, friendly place where bakers, cheese-makers, smallgoods manufacturers, butchers, olive growers, breeders of game birds, orchardists, gardeners and purveyors of mouth-watering condiments trade cheek by jowl and compete with each other in spruiking the invaluable role of the Barossa as one of Australia's great premium food bowls. Accommodation wise, the Barossa Valley is packed with B&Bs and there's the usual smattering of country pubs and family motels, but in terms of genuinely luxurious offerings it's very hard to go beyond Novotel Barossa Valley Resort, just outside Rowland Flat, the village whose local stream, Jacob's Creek, has placed it well and truly on the world's wine map. The Novotel offers a range of comfortable rooms, classy restaurant, Endota spa facilities, heated outdoor pool, tennis courts, gymnasium and direct access to the adjacent 18-hole Tanunda Pines Golf Course. And you really do need a vehicle to take advantage of the Barossa experience. It's a relatively large place, based on a range of villages well worth visiting — Tanunda, Angaston and Lyndoch among them. We chose an economic near-new Hyundai Getz from DriveAway Holidays that has very competitive offerings both here in around Australia and in Europe and North America. 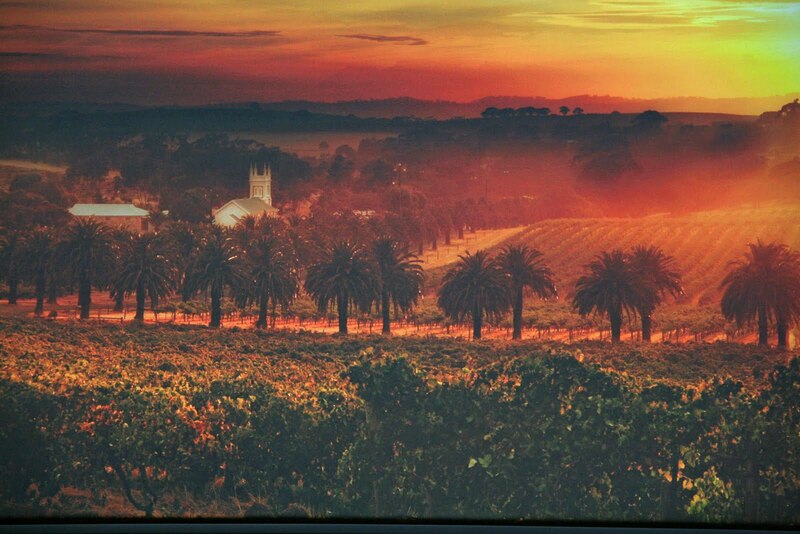 Seppeltsfield Winery – 08 8568 6217; www. seppeltsfield.com.au. McLeans Farmgate – 08 8564 3340; www.mcleansfarm.com. Barossa Farmers Market – 0402 026 882; barossafarmersmarket.com. Novotel Barossa Valley Resort — 08 8524 0000; www.novotelbarossa.com. DriveAway Holidays – 1300 363 500; www.driveaway.com.au. Barossa Valley Tourism – 1300 852 982; www.barossa.com. 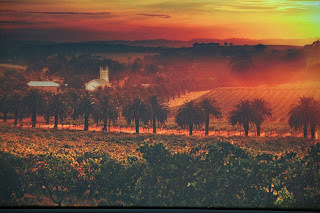 MISTY Barossa sunset ... looking over the Seppeltsfield vines and palms towards St Michael's Gnadenfrei Lutheran Church. UNIQUE collection ... casks of fine old port in the cellars at Seppeltsfield. BOB McLean amid unique bush vines ... "I'm sure it produces better fruit and that's ultimately what I'm looking for." 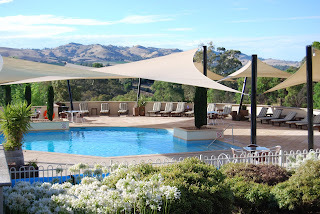 NOVOTELl Barossa Valley Resort ... luxury offerings amid Barossa hills.